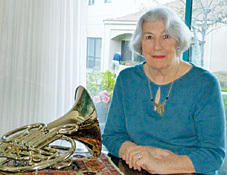 Born in Chicago in 1927, Jetta Marie Vasak attended Morton High School and participated in the band there under the direction of Louis Blaha and was an excellent French horn player. She played French horn in the Chicago Civic Orchestra for one season while attending Junior College, then graduated with a B.A. from Grinnell College in Iowa in 1950. She was employed as a social worker in California with the Bureau of Public Assistance, helping the Aged and the Aid to Dependent Children programs. She also taught 5th to 8th grades , and worked a short time at Stanford Research Institute in Palo Alto, California. While married to Alan LaFevre, Jetta was a committed political and social activist: she marched in the Civil Rights Movement in California when the Black Panthers were militant, was active in the anti-Vietnam war movement, active in political demonstrations, worked for justice for the farm workers when Caesar Chavez was trying to unionize, active in the League of Women Voters, and helped start, then worked for, the Women's and Children's Crisis Shelter in Whittier, California. In addition Jetta was an original member of the Shelter's Right Hand, and spoke to groups to educate them about spousal battering. She has been a one-woman committee to get donations of goods and money for fundraisers, helped run a thrift shop to fund the shelter, and participated in humorous fashion shows (using clothes from the thrift shop) to support local groups. As a political activist, she's worked in party headquarters, working phone banks, walking precincts, explaining propositions, and openly expressing her opinions. She's been a member of the local ACLU board, on the Family Service Board (mental health), on a Mental Health Committee that measures and evaluates the mental health needs of the community ( for many years), as well as a Committee on Aging. An ever self-less daughter and wife, Jetta took care of her mother Zdenka for many years before her passing at age 103, and then cared for her husband before his passing. She is widely known to have a quick and informed wit, and spins a bit of thought on diverse topics, mixed with a little humor, wherever she goes.